Desmond’s Hip City in Brixton, which is where I bought ‘Money In My Pocket’ by Dennis Brown, a small fortune on import. Alex Paterson the Orb. The main outlets for Trojan Records were Webster Shroeder's shop in Ladbroke Grove Market, Joe Sinclair in Ridley Road Market in North London, Desmond's Hip City in Brixton and Joe's Records inside Brixton Market ...It was therefore not unusual to see record artistes in the shop listening to the latest tunes on big, big boom boxes with 18 in speakers booming. A very intimidating place for a white person to venture into. I bought two Reggae 45s in there during 1977 (I think they were Dennis Brown's 'Here I Come' and Trinity's 'Natty On The Banking') and wrote the titles on a scrap of paper for the counter guy to avoid speaking to him. I used to buy my Reggae mainly from Music Box in Granville Arcade, which was run by white guys who provided an altogether more pleasant buying experience! For anyone interested enough, the shop is featured in the film 'Black Joy' starring Norman Beaton and Oscar James. So far as I'm aware, it closed around 1989. The chap who ran it, Desmond 'Popsy' Bryan, also ran Starlight Records in Harlesden. Comment: Mark Griffiths. (March 16, 2015) miss this record shop so much, but was really happy to know that we had such a good record shop like this in Brixton. 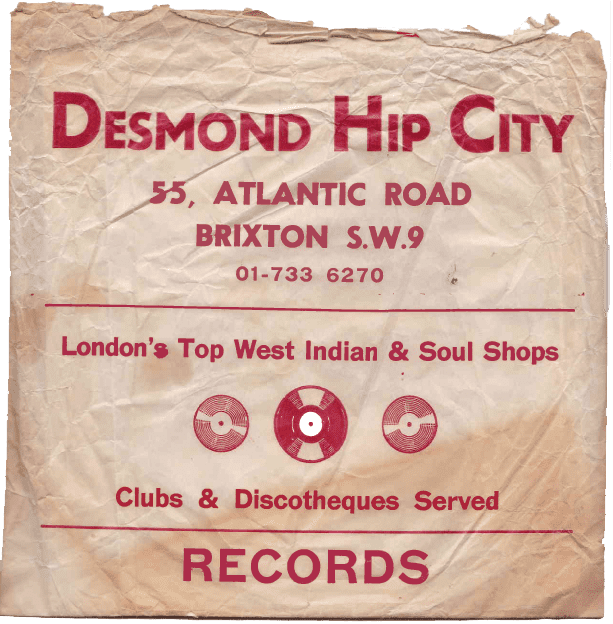 Desmond Hip City Record shop, which was one of the very first record shops in Brixton,helped to serve the community and sound systems in the community, with music that was coming into the our local area from mainly Kingston Jamaica eg. The recording studio's such has Studio One, and Treasure Isle on what was known has the 7" vinyl format a Pre-Release. MY NAME IS BUTCH CASSIDY, I AM NONE OTHER THAN; THE ORIGINAL PLATINUM FINGER, OVERNITE SLEEPER, VINYL SPIN DOCTOR AND MOST IMPORTANT OF ALL... I AM A VINYLOLIC, OOH YES!!! AH SELF CONFESS, VINYL JUNKI!!!! This addiction to VINYL started all the way back in 1971, the afternoon of Saturday 29th May 1971 to be exact. Ever since that day I have been collecting VINYL records of mainly, but by no means exclusively Jamaican musik. I landed at what was for me at the time a rather chilly and dull London Heathrow Airport on the morning of the aforementioned. My elder step brother Egon and his two tall friends, Murvin and Leroy decided to take me on a tour of Brixton. My dad gave me a crisp £5 note which was nuff money back then and off we went. On our way walking though Brixton frequently punctuated by the Three Tall Amigos stopping to chat-up girls and introduce to friends and families the youth fresh from yard, when to my astonishment I heard these familiar melodies gently wafting along on the wind, melodic songs which only couple of years earlier were tearing down Jamaica, tunes which I thought that I would never hear again when leaving Jamaica the previous day, imagine I had only died and ended up in heaven musical heaven that is. As you would have it curiosity got the better of me so I ask them where were these tunes coming from and they told me about this record shop down the road. This was my first introduction to record shops in England. My very first VINYL fix was Hugh Roy's first and seminal LP Version Galore. I instantly became an VINYL ADDICT. This Duke Reid produced Treasure Isle master piece, cost me the then princely sum of 99p paid for with the £5 that my dad gave to me before leaving home. My very first purchase in England was VINYL. Brought from the then No 1 record shop in south London, namely Desmond's Hip City, reportedly the first black owned Record shop in Brixton, situated on the east side of Atlantic Road, near the corner of Coldhabour Lane, Brixton, SW9. (July 2, 2015) I used to go to Desmon's with my mates in 1967-69 to buy imported ska and blue beat that had white labels with a stamp on them saying recorded at so and so studio, orange street, kingston, jamaica. 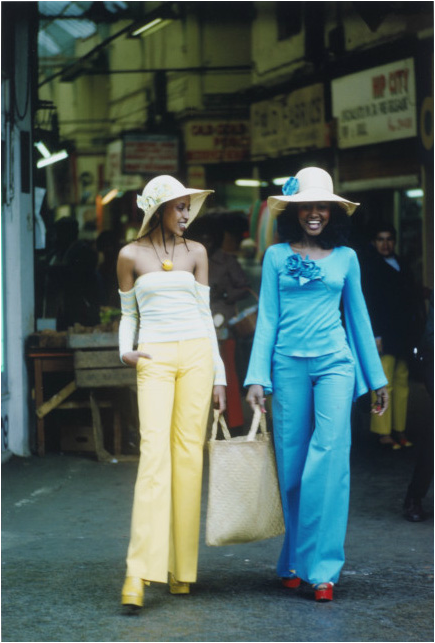 We were white kids from Carshalton in Surrey, get the train to Streatham then bus to Brixton and we would stay in the shop for ages.We loved the music! Comment: John Slater. The depth of his record box is the first thing that puts Curly B in a different league to the rest. He can draw on an endless supply of rare and brilliant tunes that few others can touch. "My record collection start from my father. When he went back to Jamaica he left me all that he had. Plus, I was always buying records, from the days of doing a paper round when we used to get fifty pence. A Jamaican '45 was fifty pence then. Straight down the record shop, Desmond Hip City in Atlantic Road, Brixton, Soferno B, Sound City, Peckings and Greensleeves in West London, Daddy Kool in the West End. All over London for my records."